I haven’t written anything here yet. So instead, I give you this picture. Holy hoops! Your blog could become a habit. *curtsy* Thanks to you both! your very actually entertaining for once i think i like reading! If this job is going to make you an alcoholic, then maybe I can help! I think I already kind of love you. Except I don’t want to mix peppermint schnapps with any of my beverages, especially Captain. Hi there, I just started a clip art humor blog. 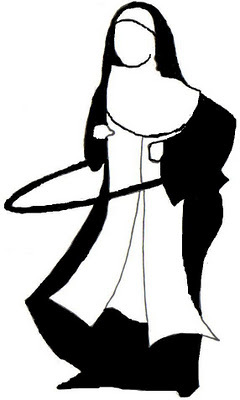 I very much like the hula hooping nun! !